Quality from the BLANCO brand. 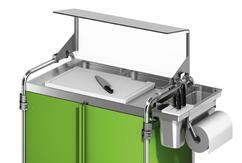 Products and systems for modern kitchen and catering management. Exemplary in quality, functionality and design. New options for BLANCO serving and clearing trolleys. All you need for mobile cooking. Brand new frontcooking website. Quality from BLANCO: Long operating life and maximum ease-of-use.